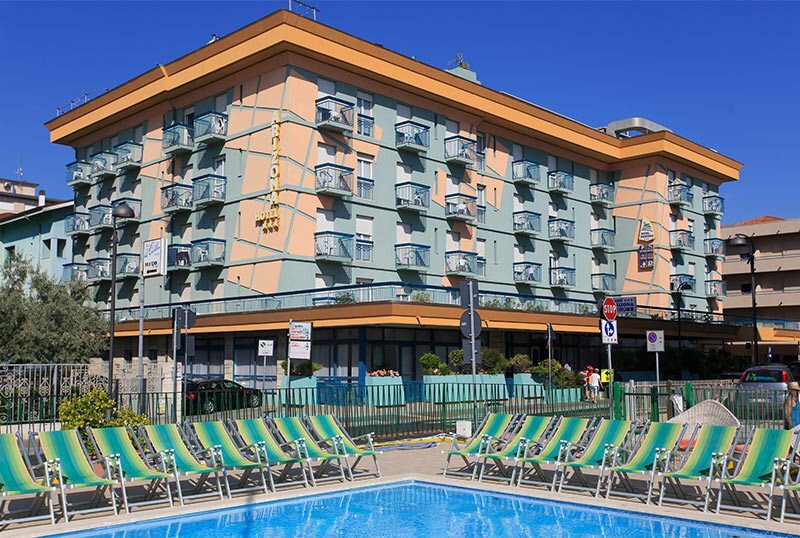 Hotel Arizona in Igea Marina is a 3-star hotel ideal for family holidays. It is characterized by the swimming pool with waterslide and hydromassage, the solarium terrace equipped with sunbeds and beach umbrella. Accessible to disabled guests and equipped for cyclists, has outdoor parking, conference room and WI-FI connection. Admits pets of all sizes. The hotel is just a few steps from the beach and close to the center of Igea Marina. The train station of Igea Marina can be reached on foot in less than 5 minutes, as well as the Parco del Gelso, a large park with games for children and paths for sports. The hotel has rooms with sea view, equipped with balcony, WI-FI, air conditioning / heating, direct dial telephone, safe, TV, private bathroom with hairdryer, curtain or shower. Breakfast in the room for a fee. FAMILIES: communicative and family solutions are available. Swimming pool with waterslide and baby bath, bike rental, open-air porch and sun terrace equipped with sunbeds and beach umbrella, lounge and relaxation room, TV room, 2 American bar, conference room, turkish bath and tanning lamp, 3 lifts, free luggage storage, night porter . For an extra charge: laundry and late check out. Organize theme nights and other entertainment activities such as dancing parties, refreshments, bike tours and sporting activities. CONVENTIONS: private beach with fee, amusement parks, swimming pool, discos and excursions. LUNCH AND DINNER: the kitchen is very attentive to local gastronomic traditions with the possibility to choose, every day, between three different menus of meat, fish and vegetables. Pasta and desserts are homemade. In hotel: strollers, children's pool, indoor playground area, baby / mini / junior club, live entertainment, baby sitter service. At meals: baby menu, seats at the table, bottle warmer. The hotel's swimming pool is located directly on the beach, equipped with a waterslide and a furnished sunbathing area. It is also ideal for children. 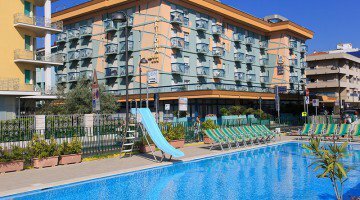 The hotel has an agreement with the Bagno Solaria 81 establishment, located in front of the hotel, equipped with sports fields, playground area, entertainment, fitness area and relaxation. • Welcome drink • Full board with 3 menus to choose from • Drinks with meals at will • Gala dinner with fish menu • Dancing party with live music • Excursion in the hinterland of Romagna between traditions and gastronomy • Daytime entertainment evening • Umbrella and sunbeds at the private beach • Entertainment, service and VAT.